As mentioned in the previous post (Flexibility in Programs I: Application), another kind of flexibility of computational representations is that computational operations can be combined in different ways to produce different results. A simple illustration is that the attenuate operation that appears as part of the program to add echoes could also be used by itself just to produce a softer version of a sound. 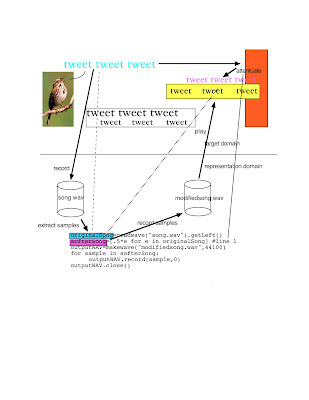 To account for this flexibility we need to decompose our computational representational system in a further way. Mathematically, the process of combining operations is composition. Given mappings whose outputs fit the inputs of other mappings, we can create a composite mapping that combines the effects of these mappings. 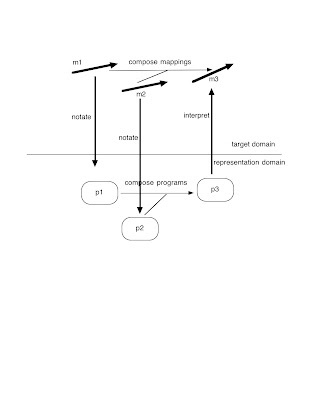 Against this background, a program can be seen as specifying two separable things: a collection of operations, and a way of composing those operations (to create a mapping that corresponds to some desired operation in the target domain.) Because these two things are separable, we do not have to start from scratch when we want a new combination of operations, just as we don't have to start from scratch when we want to add an echo to a new sound. (1) There has to be an operation on programs that allows us to get the effect of composing mappings. (2) Working with programs has to allow people to obtain these effects easily and accurately, in a sufficient range of situations. Here there are two mappings in a target domain, m1 and m2, and their composition, m3. There is a mapping notate that takes mappings to programs, and another mapping, interpret, that takes a program to a mapping. It would seem that programs in this representational system, and an operation on them, accurately represent the mappings and the composition operation. But how can interpret actually work? 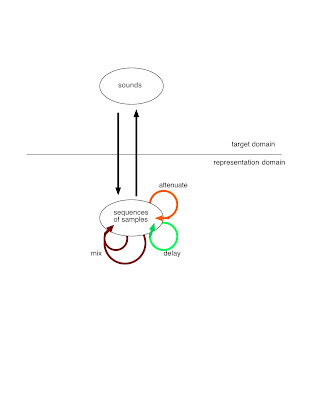 Since the idea of a representational system is that one obtains the actual results of work in the target domain, by passing through the representational domain, interpret would have to actually produce the mapping m3. But how can that be done? What does it mean to actually produce a mapping? An auxiliary picture, Figure 3b, explains this. Here a mapping m is shown in a setting that includes the things on which it operates and which it produces. 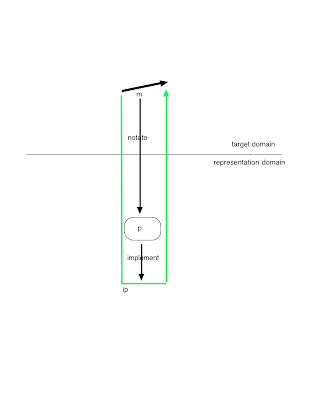 The picture also includes not only the program p, but also an implementation, ip, of program p. The implementation is an actual physical apparatus that operates on and produces things in the target domain. 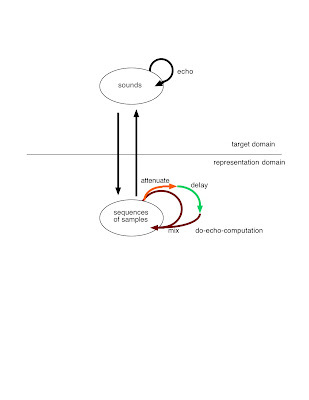 For example, in the echo example, the combination of record, do-echo-computation, and playback, operates on an actual sound and produces an actual sound. 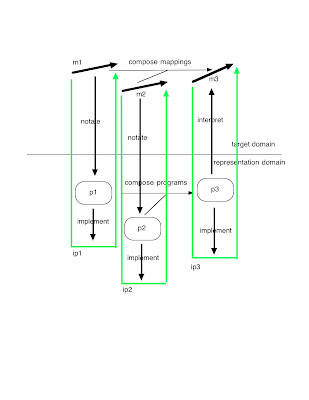 Rather than including these entities whenever we show programs representing mappings, however, we can just assume that whenever we show mappings notate and interpret between mappings and programs that there are implementations available that satisfy the requirement in Figure 3b. It is these implementations that actually produce the mappings that programs represent. Turning now to condition (2), note that this condition is about what people can do: if people can't do the required work, a programming language can't be a good representation. We'll use the term notation for representations that have to be operated on in this way by people. The mantra of this blog is, "computational systems are representational systems". The aim is to provide a view of what computer science is all about. "Computational systems are representational systems". See more of the rationale in the "Getting Started" post. Note that this "blog" isn't really a blog, it's a sort of rough paper written incrementally. So it is read best in reverse order of presentation, starting with the earliest posts. I apologize!